an offering of official AFSFA rings has been newly created. This distinctive collection of official rings is meticulously manufactured with an emphasis on quality and attention to fine detail. This beautiful ring is custom made to order by Collinson Enterprises in the U.S.A. The detail is exquisite, featuring the Security Police badge on top, Defensor Fortis flash on one side and the Air Force Defender Statue on the other side. Your initial or full name can be engraved inside the band. Rings are available in a variety of metals for you to choose. Production takes approximately 4 to 6 weeks. Order the Jewelers Stainless � it looks like white gold and is very durable for everyday wear. Or consider Sterling Silver, the queen of metals. Sterling is a softer metal than karat Gold but is much more affordable than Gold. The Sterling ring can be Gold plated to look like the karat Gold ring for a fraction of the price of the karat Gold. *The "Jewelers Stainless" metal option has an appearance similar to white gold, is very durable, and will not tarnish. **Full name or initials with badge ID number may be engraved inside ring free of charge (22 character limit). 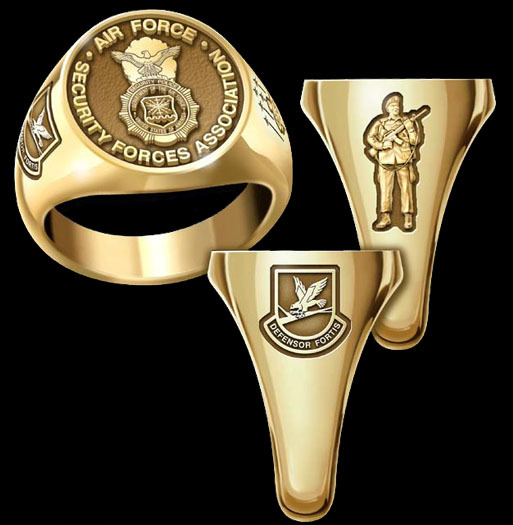 ***The sale of Federal Law Enforcement rings is restricted to active or retired employees of the agency for which they are intended, state and local law enforcement employees assigned to activities associated with that agency, and/or employees of the Department of Justice. Note: Orders canceled after 10 days from receipt of order will forfeit 50% of order price. Due to the fluctuation in our costs for precious metals, ring prices are subject to change without notice based on costs for precious metal at time of your order.